Nylon-based tarps tend to stretch during the night and when they get wet. This can be a potential problem for small asymmetric tarps because an edge sag could direct water onto your hammock. The solution is to use a tarp line tensioner—an elastic cord (e.g., shock cord or elastic medical tubing) tied to the tarp and to the guy line—to take out the slack during the night. A simple, yet effective (and inexpensive) tarp line tensioner is the humble rubber band. 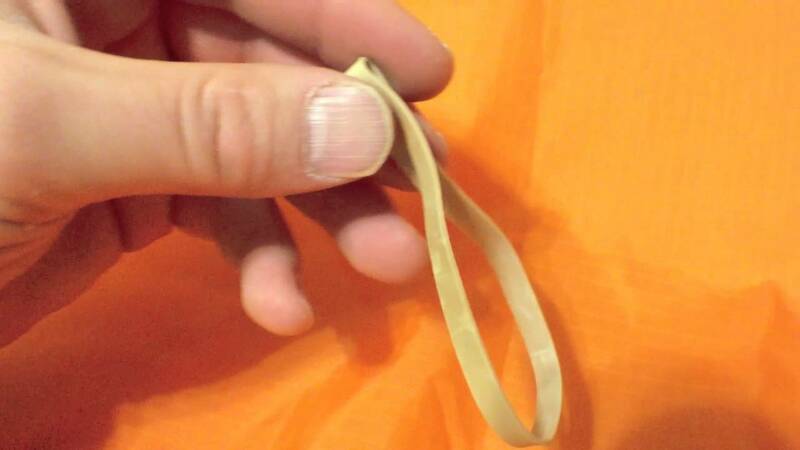 You can hook several small rubber bands together or just use one large rubber band. To install, push one end of the rubber band through the tarp tie-out and then feed the rubber band through itself to create a Lark’s Head knot. Take the guy line and tie a sheet bend on the standing end of the rubber band. For added security, leave yourself enough guy line to tie two half-hitches or a bowline knot on the tarp tie-out with enough slack so the rubber band will stretch but not break. NOTE: Rubber bands tend to crack and get brittle after long exposure to the sun. I wouldn’t consider rubber bands as a long-term solution, but they are certainly a quick and easy way to try tarp line tensioners. I have more information on tarp line tensioners on page 80 in my book, or check out HammockForums.net for detailed instructions on making robust tarp line tensioners. Nice idea I usually use shock cord instead of rubber bands but that would work in an emergancy pretty well. Yes, I completely agree. I use shock cord as well for permanent use in the field. One thing I like about the band method is the continuous loop and using the double sheet bend — it seems more secure than the clove hitch I usually use. As usual your illustrations are amazing. I just made my first set of tensioners and wish I had had this illustration then! Will have to remember the rubber band idea for emergencies. I wonder if they would be lighter then shock cord and just how long a trip I could get them to last?! OOOPPPSS my SUL background is showing again. Thanks for another great illustration and your book has really helped my hammock camping transition. Thanks Justin! Yes, the rubber bands are a temporary solution, but they work. With bigger, stronger bands it could be a permanent solution. As an alternative to the rubberband I recommend Thera-Band® Tubes (the small diameter ones in beige or yellow) or if you are on a budget the chinese knockoffs from Hongkong will do just fine. I use them for my slingshots and they are incredible sturdy and longlasting if not stretched longer than 300% the initial lenght. A solution to long-term exposure to sun is to use tyre rubber, or more specifically, the chamber rubber. that things last thousands of years in the open and takes a lot of abuse. … and if all you’ve got is bike inner tube (which is too narrow to yield a manageable loop), all is not lost! Just cut it at an angle. The shallower the angle, the longer the loop. I love the Dutchware Gear “worm”. Follow all the instructions for attaching to the tarp but use a worm on your guy line instead of tying a knot. 1. They weight practically nothing (about as long as the tip of my pinkie finger to the first knuckle). 2. They stay permanently attached to your guy line so you can’t lose them–just slide your line through the hole in the worm, tie a knot so it can’t come off the end and leave it there forever. 3. Buy stakes with a hole in them and tie your guy line there also–so you can’t lose your stakes under the snow either. 4. About as easy as it gets to attach. Just slide the worm up the line, hook it to the tarp (see instructions on this page), pull your line as tight as you want and tie the worm (see instructions on the Dutchware gear site). The only drawback is they are too small in the winter when you are wearing gloves.